Value proposition: Provider of a B2C robo-advisory platform for individual investors. This time, the story is about Ignition Advice (formerly Ignition Wealth), one of the most influential robo-advisors in Australia, who decided to go international a few years ago. The company has offices in Sydney, Australia and Dublin, Ireland. Penetrating the European market is a dream of many companies. 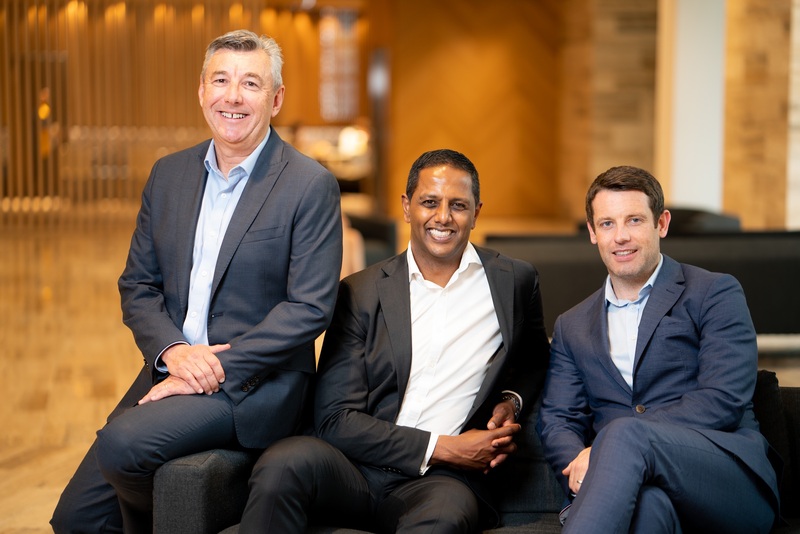 To learn how Ignition Advice managed to overcome the various struggles and run a successful business outside their home country, we spoke with Manish Prasad (CEO), Alan Quinlan (Head of Ignition Advice Ireland) and Mike Giles (CTO). Manish is a former strategy and market-development consultant for KPMG and Capital Position Ventures. Also, he held executive roles at the National Australia Bank Group, which ran national-scale-advice businesses, for five years. During these periods, Manish gained a substantial vision of the industry, which helps him now to run a successful business in financial technology. Alan spent 12 years in wealth sales in Ireland and Zurich in the banking and the broker-distribution channels. In Sydney, he spent seven years working for Westpac on the investment platform. While working on his projects Alan met Mark Fordree and Mike Giles, who convinced him to join their team. Now, Alan is the head of the European branch of Ignition Advice. Mike has been working in financial services for over 30 years now. He spent a lot of time working on treasury and core banking systems, and started by building mainframe systems for banks. About 10 years ago he took part in building digital tools for advisors at one of the big Indian wealth companies. There, he gained knowledge in the concept of high-scale systems, as people were entering that market in the thousands upon thousands. Having completed that project, he came away with a much broader view of the financial-advice market. During the interview, we discussed the technical part of building a robo-advisor, organizing communication between distant teams, and going global through opening a department in a country on the other side of the world. The feature-set of Ignition Advice involves everything needed to provide wealth-management advice, including rebalancing and goal-planning capabilities. Their technology makes it possible to find a business philosophy and then plug that into the portfolio for management and rebalancing. Manish’s conviction is that the support for existing advisor channels is a byproduct. The solution employs single-user journeys. They’re all linked around the individual’s goals. The offering includes a goal-explorer module that allows the individual to self-serve and go through goal exploration, as well as a goal dashboard. Analysis of and deep insights into customer behavior have given Ignition access to about 5 million business customers. As the solution matured, they needed to focus all their resources, provisional ability, and capital towards being a partner to large enterprises globally. Now, they’re wholly and solely focused on being an enterprise player. Also, Ignition have had a great impact on the investment market in Australia. Manish says they’re one of the only firms in Australia to integrate with The Link Group, which works with the major pension funds in the Australian market. Also, they’ve integrated XPlan, which is leading financial planning software in Australia. In Ireland, however, the impact tends to be even more significant. According to Alan, the Irish market has suffered from the lack of investment over the last 10 or 15 years. Most markets there don’t need a license to give advice, while Ignition has in-house capability to provide advice around the regulatory side. At the beginning of their history, for about 10 years Ignition Advice had only about five developers working on the project. They were full-stack and highly experienced, with Mike personally leading the team. The stack was .NET, SQL Server, and Amazon AWS. The project has grown iteratively. From a cross-functional team wearing many hats they transformed into a distributed and Agile one, with a dedicated scrum master running one team and the head of development running the other. According to Mike, the old version of the system didn’t provide a very good user experience as it had no UX developers and no analysis. However, the market grew beyond that and everybody wanted a much better UX. Thus, they broke up the teams into front-end and back-end. Thus, the solution is not about building a one-time experience. They allow customers to eventually build their own experiences in their own tools, utilizing Ignition Advice’s API. This doesn’t interfere with them staying with a consistent UX model and guideline; the omni-channel approach allows customers to decide how they want to be serviced. Today, the company has several teams around the world. In Sydney they have 12 developers, and right now they’re starting a small team in Indonesia to strengthen their back-end services. In Dublin, there are UX developers that are closer to the actual end clients in Europe. According to Mike, they have always had a good layered architecture because engineering was always a strong process. They never tried to build a whole system. During project development, they peeled off unused features and integrated APIs. As for team structuring, they have separate parts, such as a development organization, product design and analysis, professional services, a sales organization, etc. Among these, only technical consulting and product consulting are in both Ireland and Australia. For communication and coordination, Ignition Advice uses Jira, Confluence, and BitBucket. They heavily utilize Confluence as the repository for all of the knowledge, design calls, meeting recording, and so on. Also, there’s a DevOps person in the company who specializes in keeping that repository in order. For spreadsheet storage they use Box. At the same time, slack is the backbone of the company. They have channels for each project, feature channel, etc., as well as direct messaging. Here, a lot of knowledge transfer happens informally by osmosis, but generally they bring in staff with a high level of financial acumen. Ignition Advice’s general plan is to serve large enterprises globally. The company will continue to build around the European and Asian client, now looking at the client’s first technology. Currently, Ignition Advice exposes and manages their APIs directly. However, they want to bring in a mediation layer with companies like Amilsoft to create this new extraction layer. For the company, this will mean more developers can have their hands in different parts of the code without treading on each other. Among the challenges the company are facing, Manish lists finding the right people to work on wealth-management projects and helping their clients through education. They combat these struggles by being selective in who’s recruited and designing customer journeys in such a way that they can quickly get to the bottom of investing. Also, scrutiny from the government around community standards and regulations for financial-product delivery has increased of late; this challenge remains to be solved. Claiming new markets is always difficult but productive. Solutions like that provided by Ignition Advice can bring revolutionary ideas to the overall market. This is why it’s worth keeping track of their launches and deriving inspiration to set big goals.